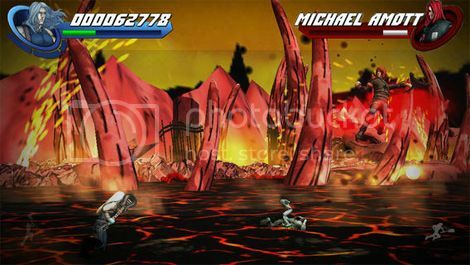 Set in the same world as the comics, Eternal Descent: Heavy Metal Heroes is a simple game aimed primarily at those who want to kill time, and rock out. Metal. It's an element of this great world. It helps humanity to build bridges both metaphorically and physically. The music genre of said term has produced some of the most iconic individuals in recent decades. Ozzy Osbourne, Jean (from Kiss) and the lead singer of Metallica. Also, you can't forget that king of party Sir Andrew WK. He might not be metal but he shits over most 'metal' indie cindies of the current generation. Ridiculously addictive games seem to be the iPhones only market at the moment, with developers fighting to create the next gaming equivalent of crack in a vain attempt to take gamer's attention away from the casual gaming addiction of Candy Crush and the behemoth that is the Angry Birds series. Set in the same world as the Eternal Descent comics, Eternal Descent: Heavy Metal Heroes is a simple game aimed primarily at filling the time between getting on the bus and getting off; obviously with the intention of taking over in the evening and any point that you have a spare moment. The premise is great, with the aim of the game being to defeat all sorts of demons using your supernaturally charged electric guitar whilst constantly running towards the inevitable end. Standing in your way are guitar bosses taken from the comic series, each with their own strategy to cause you endless doom and death. 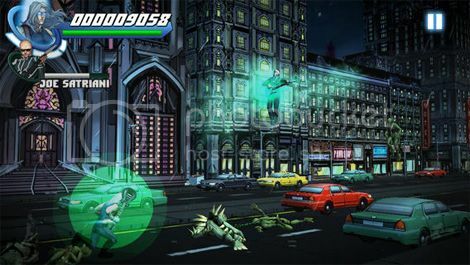 The crisp graphics from the comic are realised well on the iPad and iPhone, but the backgrounds don’t really vary that much. The enemies vary, but the gameplay does get a bit repetitive and the control scheme does seem to be out of whack at times. Response time from touching one of the two ‘action’ states can be sluggish as the animation takes far too long to start and complete, which leaves you open to losing health fast and unfairly, which is not something you want when the aim of the game is to get as far as possible. This is not down to the iPad being slow or poor hand eye co-ordination; far from it actually. Sound wise, the game has it nailed, and you would hope so for a game based on a music rock band comic. Pulsating and driving, the music fuses and forces you to keep on trying, but you can't ignore the fact that the game gets repetitive and mundane extremely quickly. If you are looking for a quick fix of gaming or you are a fan of the comic series, then I guess the game is up your street. You can pick it up for £1.99 from the App Store.